Well, today is the second day of our "Birthday Celebration" sneak peeks from REVERSE CONFETTI. We're keeping the party going with some darling projects to show off today that will be available on MAY 8th! 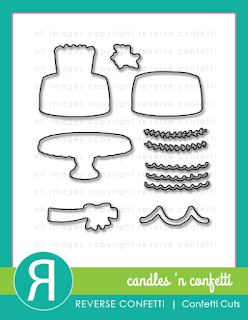 Today, we are featuring two new stamp sets--CANDLES 'N CONFETTI which has a coordinating CANDLES 'N CONFETTI Confetti Cuts die set, and CELEBRATIONS which is THE most perfect stamp set for all kinds of festivities. My first card uses the new CELEBRATIONS stamp set along with some other unique dies. 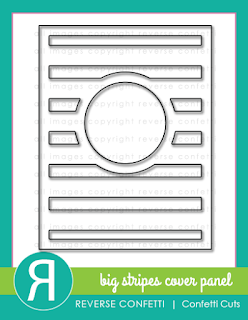 This month, we are introducing the BIG STRIPES COVER PANEL Confetti Cuts die. 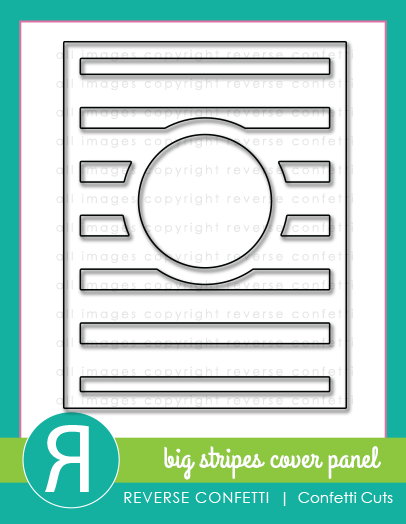 This die covers the entire front of an A2 (4.25 x 5.5) card and is really trendy with the wide stripes. I cut mine from black cardstock and backed it with some gold mirror cardstock. You can see a stitched line around the circle part of card. 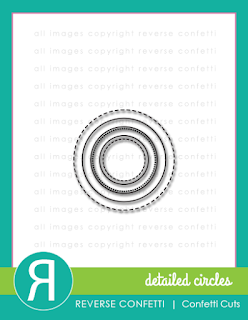 That is done with a fun circle set that works perfectly with the cover panel called DETAILED CIRCLES. The white circle in the center is the negative of a white cover panel that I cut for my next card. 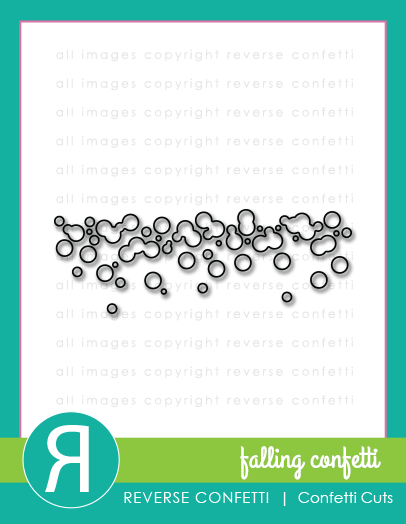 I then used the new FALLING CONFETTI Confetti Cuts on the white circle and added some pink dots and rhinestones for lots of bling! 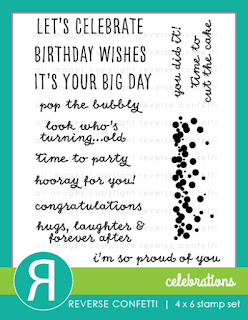 The CELEBRATIONS stamp set was used for the sentiment in black and gold ink. 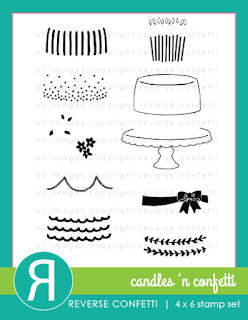 My next card uses the CANDLES 'N CONFETTI stamp set that lets you "build" your own cakes. With all kinds of accessories to choose from, there are tons of possibilities! Once again I used the BIG STRIPES COVER PANEL, but this time, I cut it down and only used part of it on my card. I also embellished it again with the DETAILED CIRCLES Confetti Cuts for that stitching and the aqua center circle. The sentiment is also from the new CELEBRATIONS stamp set. I honestly think that set is becoming my new favorite! Ok, that's about all from me today! Come visit me again tomorrow! We have lots more sneak peeks to share tomorrow as well. Then, everything will be available on the 8th. 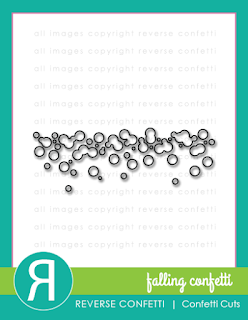 Don't forget that Jen has a link list going daily (MAY 5-8) for all the sneak peeks over on the REVERSE CONFETTI blog HERE. Leave a comment on each of the designer's blogs for a chance to win a $30 gift certificate. We're giving away 3 of them!! Comments will close at noon CST on MAY 7th and the winner will be announced at 5pm on MAY 7th on the Reverse Confetti Blog and our Facebook page. In addition to having a chance to win just by leaving a comment on the sneak peek posts, we are also running a Facebook promotion for a chance to win a $30 gift certificate. After you are done checking out the sneak peeks, head on over to OUR FACEBOOK PAGE and look for the promotional graphic. Simply amazing!! Love your colors so much! Both so different! Both so amazing!! You really showcase the new coverplate so well! Thank you so much!!!! Love your beautiful unique cards. Thanks for the great ideas. Such detailing works and sweet layering in both creations, love them! gorgeous colors, fabulous details Susan! thanks for the cutting visual. love it. These are great! Thank you for the inspiration! 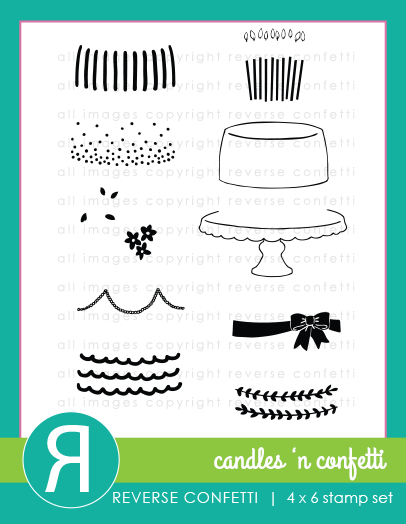 These cake cards are so cute! Both of these are such fun cards. Love the partial use of the cover panel. Wow -- these are amazing! Thanks so much for sharing your colorful designs! 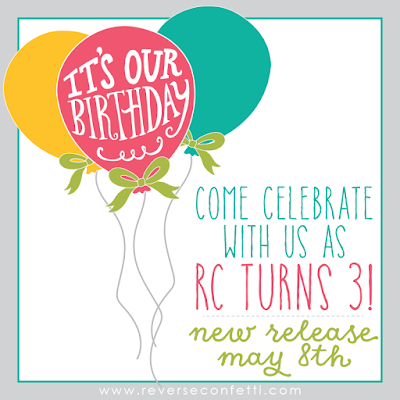 Happy Anniversary to RC! Gorgeous card! I love the innovative use of the dies. very different look with the black & gold-very on trend! Love both your cards today...black and gold is so modern and great for special celebrations! Very creative!! Love the layers! Great cards. I like how you the layers look. Love the black and gold. Really makes a strong card. Your cards are very celebratory! 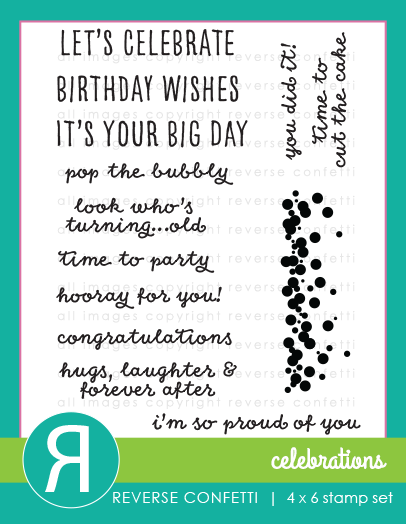 What a chic look on your first card! Your second card is just awesome as is the first. Love your use of the new items. Love your cards and designs. Such great new dies and stamp sets. Great idea to trim the cover panel, and I love your use of gold on the first card!! I LOVE his gorgeous pink and gold foil! It makes your card look so festive! Great color combos. I really like the pink and gold. Love how you used the same striped background panel in 2 different ways to highlight the focal image. Love the gold and love the polka dots. Very pretty cards. what a fabulous set of cards!! Both cards are lovely. Glad to see the confetti die used. Both cards are fun and adorable! Thanks. Both are awesome, Susan! Love the different way you show those die cuts. Love the use of banners in these cards! Love what you've done with these fabulous sets! I love the way you used the background die set in 2 different ways. That gold stripe is so awesome and the different textures and colors in the 2nd one are great! Pretty cards! Great use of that awesome Big Stripes Cover Panel! 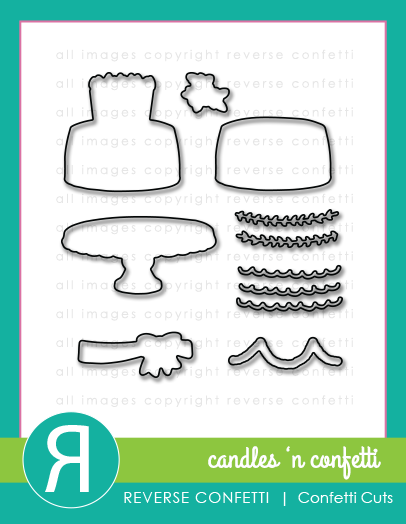 Love the fun Candles 'n Confetti set! Wow!!! Absolutely fabulous cards!!!!! Love, love, love!!! Wow - 2 very different but amazing cards! Love the gold/pink/black color combo - stunning and elegant! LOVE that you cut down the cover panel for the other card - it creates something completely new! Cannot wait to get that cover panel!!! OMG Susan ... you have really out done yourself with this beautiful black and pink Stripes Panel. Wow is all I can say! Love the cakes!! Great cards. Thanks. Two beautiful cards..... love every perfect detail! Love, love, love! Awesome color combos and love how you trimmed away part of that background die!